"River Scene with a Bonfire, Moonlight." Photo: Hepworth Wakefield Gallery. Welcome to the October ArtSmart Roundtable—a company of travel bloggers passionate about discovering art while traveling around the world. Each month, we highlight a particular theme and October is dedicated to the "artist." 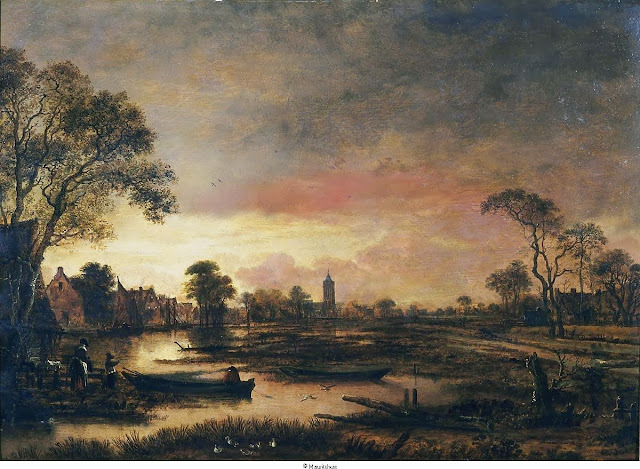 It's no secret that I love the Dutch masters from Avercamp to Vermeer but my artist of the month is one whom captured my imagination during my last visit to the Mauritshuis Royal Picture Gallery in The Hague, Netherlands—Aert van der Neer. Up until then, I knew very little about this artist of the Dutch landscape but while examining Vermeer's "View of Delft" and Avercamp's "Winter Scene"—among others, Van der Neer's winter scenes and moonlit landscapes drew me in so much so that I needed to find out more about this Dutch master of the moonlight. Like Vermeer and Avercamp, Van der Neer captured life in the Netherlands but it was his passion for the nighttime and frozen winters that's unique and through his paintings, he invites you to glimpse a moment frozen in time. Let's go in for a closer look at some of his finest work and at the end of this article, be sure to check out the contributions by the artists of the roundtable! "Winter Scene with Skaters." Photo: Hepworth Wakefield Gallery. "Landscape, Day." Photo: Hepworth Wakefield Gallery. 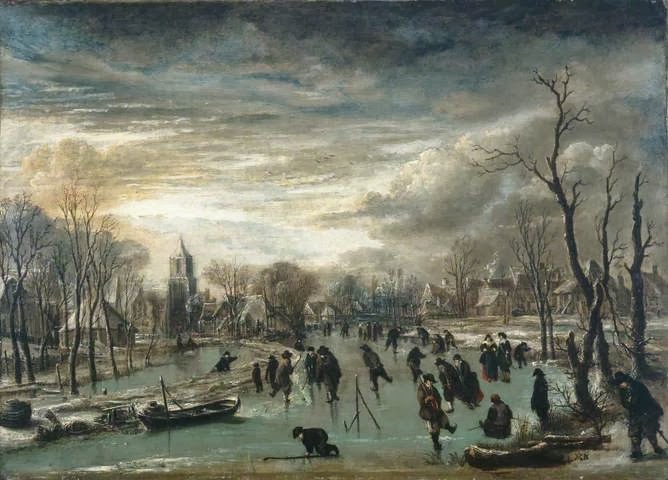 Born c. 1604, Aert (Aernout) Van der Neer was a Dutch Golden Age (predominantly 17th century) painter renowned for his moonlit landscapes and winter scenes with ice skaters. While little is known about his early childhood and formative years, he did grow up in the south of the Netherlands where he presumably trained with another Dutch Golden Age landscape painter, Rafaël Govertsz Camphuysen who inspired much of his earlier work along with Avercamp. "Frozen River Scene." Photo: Hepworth Wakefield Gallery. In 1629, Van der Neer married Rafaël's sister, Lysbeth, and had six children, one of whom achieved artistic renown on his own—Eglon van der Neer. Van der Neer, the elder, went on to hone his craft until something spectacular occurred in the early 1640s. Van der Neer developed a fascination with light, the quality of light found only under a moonlit sky, the setting sun or the burning glow of nearby bonfire. This fascination became his obsession and soon he realized he had a talent for rendering dramatic scenes of the night. 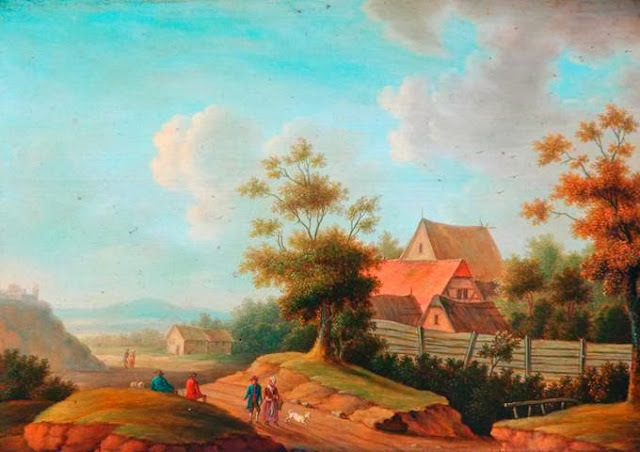 His newly ignited passion created some of the most striking settings of his native Dutch countryside and eventually earned him the respect and recognition of a Dutch master landscape painter of the Golden Age. A little did-you-know fact about the scenes depicted in Van Der Neer's landscapes—most of them are not real, figments of Van der Neer's fanciful imagination at play. "Landscape at Sunset." 1650. Photo: Mauritshuis Royal Picture Gallery. "Skating Scene - Figures on a River Flowing Though a Village." Photo: Hepworth Wakefield Gallery. "Landscape, Moonlight." Photo: Hepworth Wakefield Gallery. Through the end of the decade and the next, Van der Neer proved to be a prolific artist producing many nocturnal paintings but in 1959, his meager earnings were just not enough to sustain a living. Van der Neer, like many starving artists, needed to supplement his income so he opened an Amsterdam tavern—"de Graeff van Hollant" in 1659. Unfortunately this new venture failed three years later and by the time Van der Neer died, he was impoverished, but his legacy lives on—four centuries later! "Landscape with Windmill." 1646. Photo: WikiMedia.org. "Canal in Winter." Photo: Hepworth Wakefield Gallery. 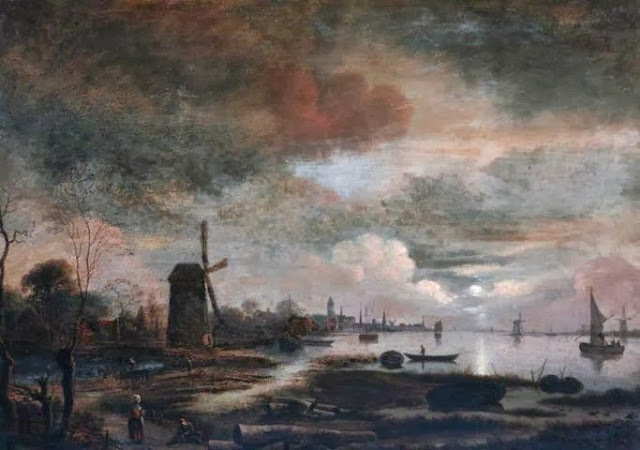 Much of Aert van der Neer's work can be viewed at the Mauritshuis Royal Picture Gallery in The Hague; the Rijksmuseum in Amsterdam; the Hepworth Wakefield Gallery in West Yorkshire, UK; National Gallery in London; the Metropolitan Museum of Art in New York—among others. 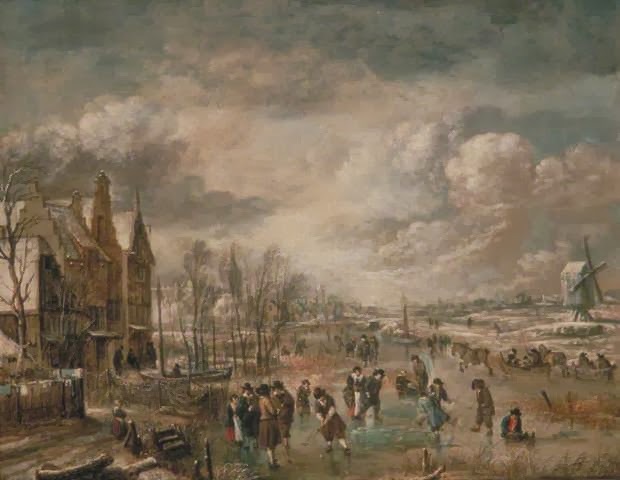 I hope you enjoyed this journey to Van der Neer's 17th-century Netherlands! You can find us on Facebook too!. I can see why van der Neer drew you in, Jeff. I'm also surprised that I hadn't heard of him before either. So thanks for this post. I'm intrigued by his work and wondered how he was able to recreate these amazing canvases. That he worked from his imagination makes him even more impressive. Hi there Marcia and thank you so much for stopping by!! Something even more incredible: not only did he paint mostly from his imagination but he did so indoors! Isn't that amazing??!! Wonderful post, Jeff. You know how much I love Dutch painting! 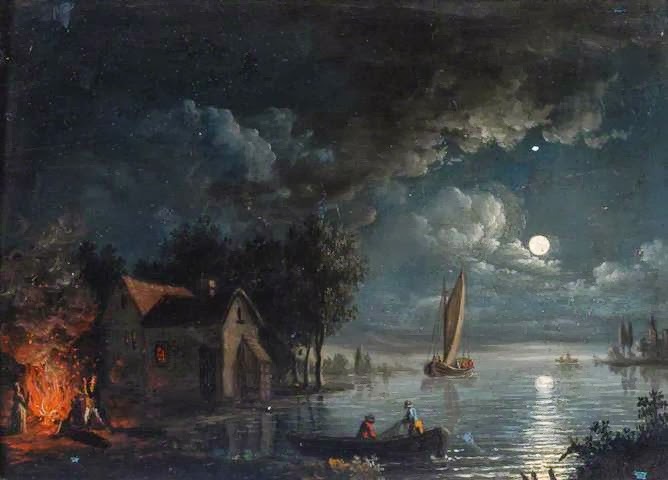 I don't think I've ever seen one of van der Neer's moonlight paintings. It really is amazing that he painted these scenes from imagination, indoors. Oh Lesley, I couldn't wait for you to stop by and share your thoughts. I do know how much you love the Dutch artists and so happy you like this post. Next time you visit one of the galleries I've mentioned above, look him up. You'll find he holds a most prominent place among the Dutch masters! Thank you again!! I particularly like Landscape Day and Frozen River Scenes. I can see why you love this artist so much. 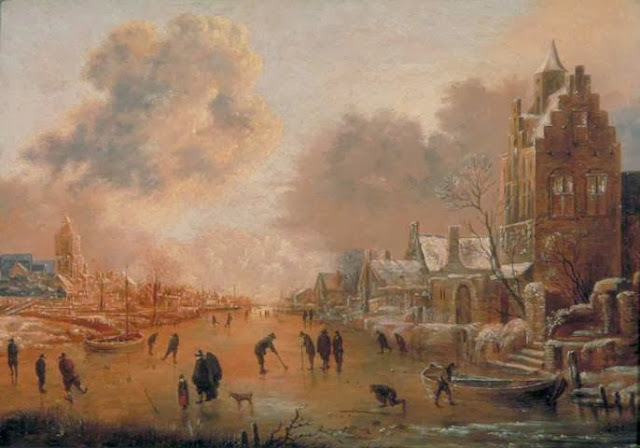 Interesting to see skaters back in those days and it makes me wonder how often the canals freeze over in this day and age. Hi there Leigh and thank you so much for stopping by. I really do love Van der Neer's style. It draws you in so much that you inspect every inch of the canvas to see what's going on. It's like glimpsing into a snow globe. I wonder if the canals freeze over like that too with all of the increased boat traffic we see today. I also love the Dutch Masters -- especially Vermeer. But I didn't know of Aert van der Neer although perhaps I've seen his work somewhere. What a great introduction to him here. The paintings are amazing. Hi there Cathy and so glad you enjoyed this post!! 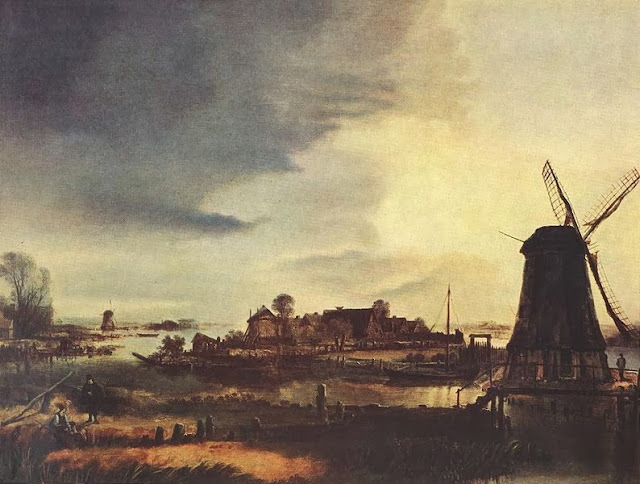 I fell in love with Vermeer's "View Of Delft" and Avercamp's work as well but didn't really know too much about Van der Neer until I wrote this article. I remember seeing him in The Hague but I forgot until just recently. I too love his work. Thank you so much for stopping by to share your comments!! Hi there Mike and thank you so much for stopping by! Like you, I too like to immerse myself into the art and examine the entire canvas from afar and up close as well. I like your idea about reading the caption last ... no preconceptions that way and your imagination is free to roam. I love the Dutch masters too but haven't heard of Aert van der Neer before so this was all very interesting. I really like how the clouds and sky seem to be a big part of the canvas. My favprite has to be Landscape, Day only because it's so bright. Thanks for all this information. Hi there Mary and thank you for stopping by to share your thoughts! I think my favorite is "River Scene with Bonfire, Moonlight" followed by "Landscape, Day." So glad you enjoyed the post. Hi there Heather and thanks so much for stopping by. I couldn't agree more about Schiphol, it's filled the masters' art. You must make time for a visit to one of the museums as well on your next visit. You won't regret it! 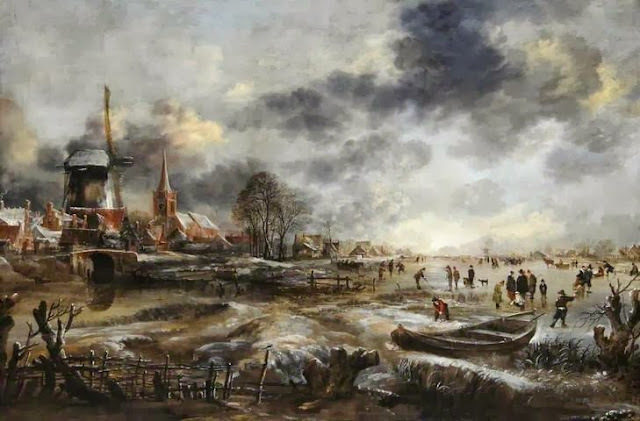 Wonderful choices as part of the Golden Age of Dutch painting; so evocative of my favorite Dutch winter scene: Winter landscape with ice skaters by Hendrick Avercamp from the early 17th century. My eye never stops roaming through the myriad activities on the frozen canal. Hi there Tim! I couldn't agree with you more about Avercamp. I loved the works I saw in the Mauritshuis in The Hague and like you, I found myself wandering through each activity in the scene. The detail he achieved is remarkable much like van der Neer above. Thank you for stopping by to share your thoughts! I love to read comments like this. I've seen photos of van der Neer's "River scene with a bonfire, Moonlight" on the internet and would love to see the painting in the flesh. Aren't they fabulous? Did you see the links above that show you how to see his art in person? Please stop back here again when you do and share your experiences. Thanks so much for stopping by and sharing your thoughts!